WordPress plugins can transform a simple blogging website into something much more interesting. You can also use plugins to make management improvements for the webmaster and speed optimisations for visitors. 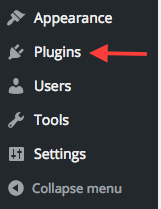 To browse recommended plugins, log into your WordPress admin panel. Use the left hand side menu to select 'Plugins'. From the top menu, choose 'Recommended'. 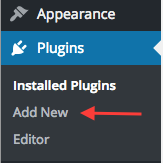 WordPress will showcase a list of recommended plugins that are based on what you have installed so far (if any) and what other WordPress users are installing. Each plugin will explain whether it is compatible with your version of WordPress. 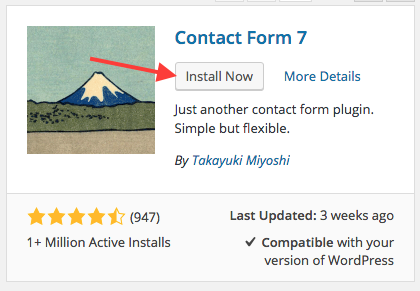 A plugin can be installed incredibly easy by selecting the 'Install Now' button. Once activated, the plugin will be available to use immediately. There are thousands of plugins to choose from that you could install on your WordPress site. However, we feel that the following should be recommended. It's bread and butter that every website should have a contact form and Contact Form 7 is one that stands out from the crowd. It is used by over 1 million websites which truly shows how good it is. With full control on what information you would like to appear on your contact form and good spam protection, having this plugin is a good decision. Time is money and it makes sense to have your website load as fast as technically possible. With WP Super Cache, it offers a fast method of serving your WordPress pages from a memory store, so there's absolutely no delay loading up the information at lightening speeds. You want to be able to bring in as many visitors as you can to your website by having a strong position in search engines such as Google. With All in One SEO Pack, it helps provide the necessary improvement to search engines, and fine tunes the content on your website to make you more favourable for showing in the search engines as high as possible. In includes XML sitemaps and Google Analytics support, making other plugins that offer the same services unnecessary. If you've ever thought about the e-commerce world to sell products to your visitors, WooCommerce is an excellent solution. It will fit alongside your existing website and makes adding products incredible easy. Visitors can simply order directly from you and not even realise that your website started off as a blogging site. It includes all of the necessary facilities to send order confirmation emails, raise invoices, create shipments and so forth. JetPack is a plugin from the same company who built WordPress, so they truly know what they are doing. They claim to be able to increase traffic, site speed and most importantly, offer protection from malicious hackers. Join over a million users and add this to your website.